This article is about the microgame from WarioWare: D.I.Y. Showcase. For other uses of the term "Outta My Way", see Outta My Way. Info "Get past all those Sunday drivers." Outta My Way is one of Wario-Man's microgames in WarioWare: D.I.Y. Showcase. Wario is riding the Wario Bike and has to dodge all the cars for eight seconds at the slowest speed. 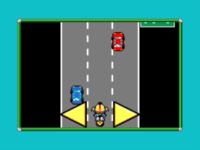 To do so, the player must press the arrows following the bike to change its position between three lanes. The player will lose if Wario hits a car. This page was last edited on November 14, 2018, at 19:39.